The boxes above show the cost of a simple funeral at each of the crematoria in our local area. We offer an extensive range of funerals which are illustrated below. Please do not hesitate to contact us by telephone to obtain an accurate quote. To determine the total cost of the funeral, the three separate parts have to be added together. These are the third party fees that the funeral director pays on your behalf. Fees at the crematorium or cemetery, the minister’s fee or fees for a church service, the organist’s fee and for a cremation, the doctor’s fees for completing the statutory cremation forms. For a cremation, these fees currently total approximately £1,500. For a burial, disbursements currently range from £2,900 to £4,600, depending on the location and type of grave purchased. Your funeral director will be pleased to advise you on the exact cost of your requirements. 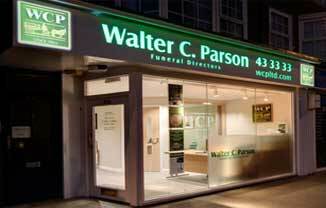 Walter C. Parson offer an extensive range where the cost of the funeral varies depending on the choice of coffin or casket that is chosen. All of our normal services are included within the cost; these are the removal, hygienic treatment, viewing at the chapel of repose, arranging the funeral, providing a hearse and bearers and most choices provide at least one limousine for the family. The packages are designed to accommodate every type of funeral that is chosen, from the traditional, through our green range, to the bespoke. The exception to this is the Simple Basic Funeral which provides the essential requirements for a basic funeral and makes available further options at additional cost. Should you have a choice of coffin in mind that is not illustrated below, please do not hesitate to make contact with us and we will be more than willing to discuss further options with you. This might include additional limousines for the family, newspaper notices, floral tributes or funeral stationery and perhaps the disposal of the Cremated Remains after a cremation. Also if the death occurred, or the funeral is to take place, some distance from our offices, then an additional mileage charge may apply. All costs involved will be fully explained to you. We provide a detailed written estimate before the funeral and our itemised account is sent soon after the funeral. If there is anything that you do not understand, please ask. We offer a discount on the cost of the funeral if the account is settled in full prior to the funeral taking place. Please enquire with one of our offices for further details. Please telephone and ask us for a quote – we are probably less expensive than you think.